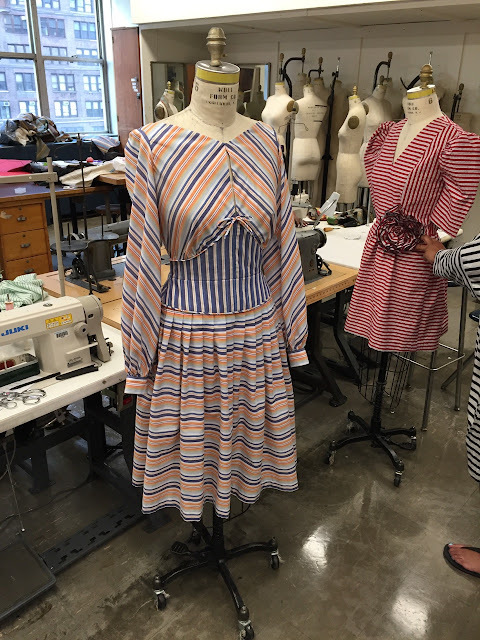 For my draping class at FIT, we were required to drape a striped dress and make it out of cotton fabric of our own choosing, and complete it by yesterday evening. 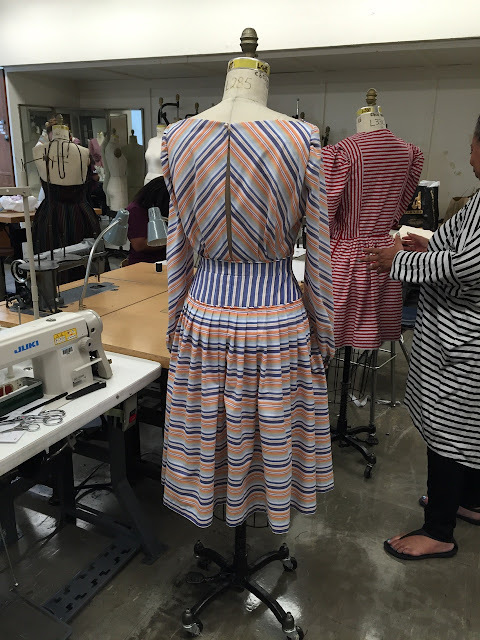 This coming Monday -- our last class -- we'll all display our dresses, get our grade, and have a party. Little by little the design started to come together. 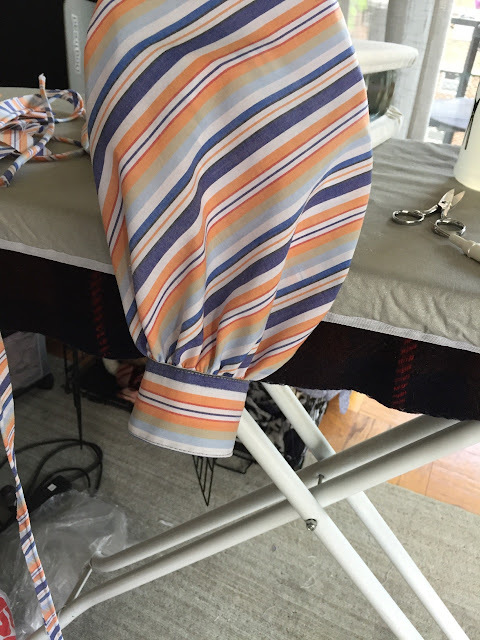 The narrow-striped yoke was created by tucking the fabric, folding out most of the orange stripe. 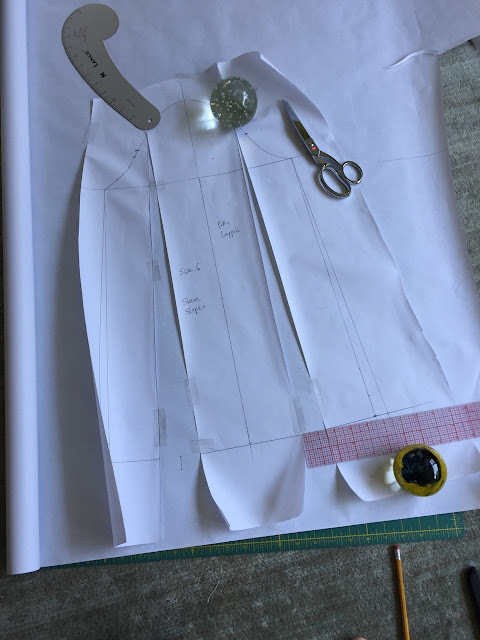 Using methods I'd learned in my flat patternmaking class, I drafted a bishop sleeve from the size 6 sleeve sloper our draping professor had us trace the first day of class; sleeves are generally not draped. I cut the sleeves on the bias and the cuffs on the cross grain. I made piping using bias strips -- my first piping ever and surprisingly easy to create and to apply. (You can see me make it here.) I also made bias tubes using a loop turner, as I originally envisioned button loops. I nixed that idea ultimately, but I did use one tube to make a bias bow for the center top of the midriff yoke. The bias piping turned out to have been a stroke of luck, as it allowed me to attach my skirt -- pleated all around and balanced at the hip -- from the right side of my fabric by simply stitching in the ditch. It would have been very difficult to attach this from the underside. 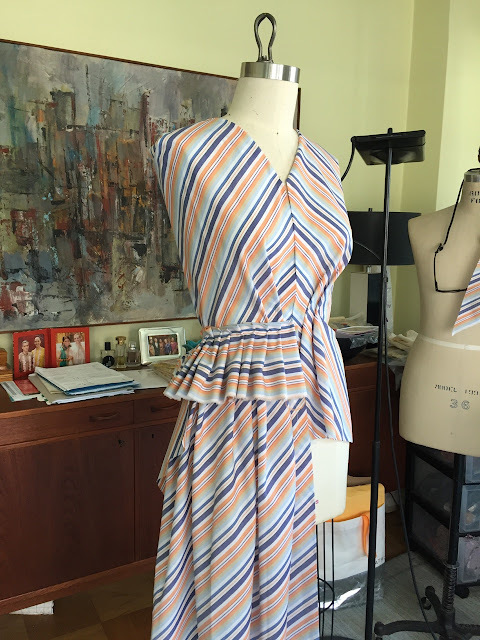 Same was true with the bodice: I could work from the right side of my fabric and see exactly what was happening as far as stripe matching was concerned. 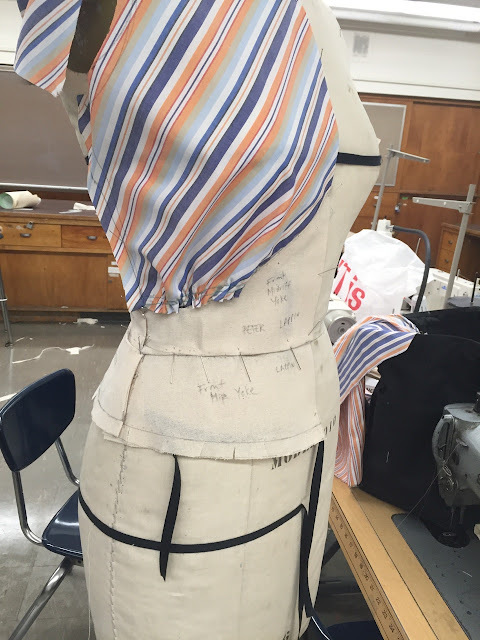 We had to create facings for the front and back bodice and use sew-in interfacing on the facings. 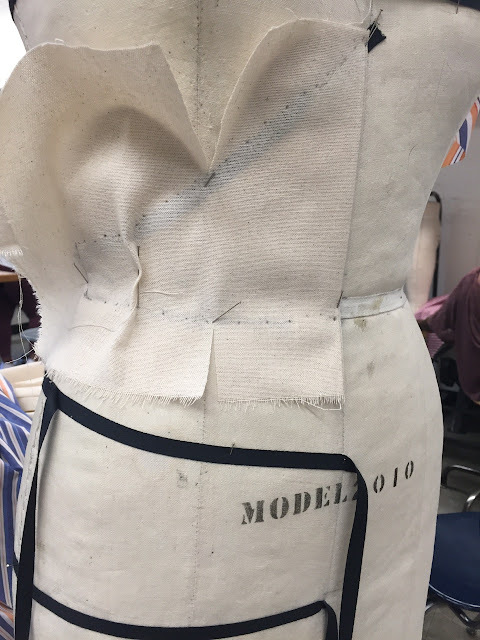 Since my front and back were two pieces each and cut on the bias, this created more work for me but allowed me to stabilize the bias very successfully. 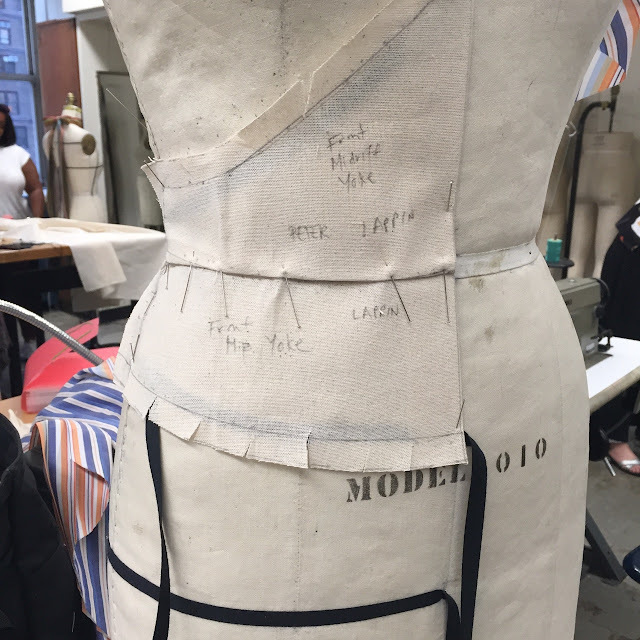 There's a long side zipper on the left side seam and a hook-and-eye closure at the top center of the back bodice. The front top center is stitched together at the neckline and open to the midriff yoke. 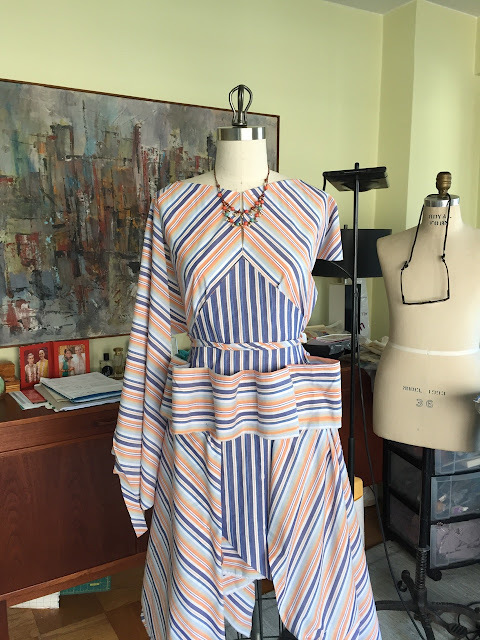 This is one of my favorite sewing projects: I think everything works. 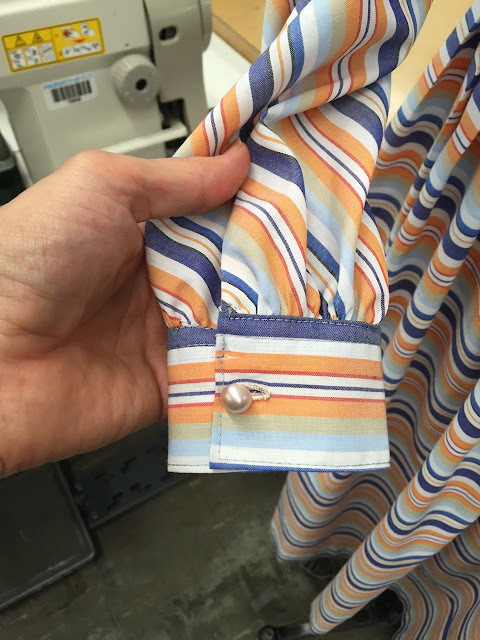 Even the fact that the fabric was a cotton-poly blend -- initially a disappointment when I did a burn test -- turned out to be a positive: the fabric doesn't wrinkle and it still drapes beautifully and takes a crease extremely well. If I were to make one criticism of my dress, it is that the design is, unquestionably, echt Forties. I mean, Barbara Stanwyck could have worn it in Christmas in Connecticut. 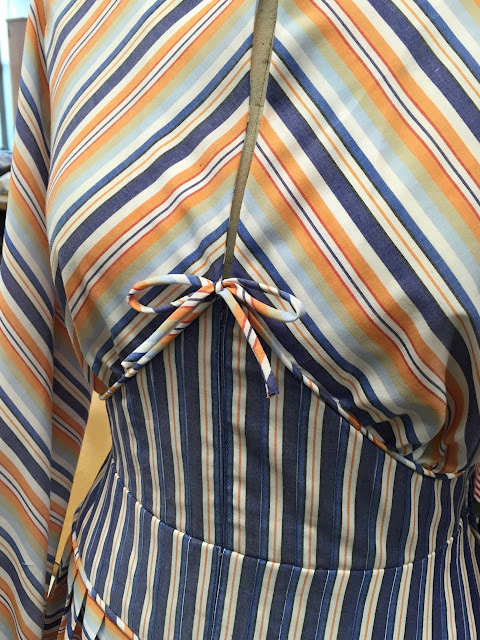 For inspiration, I had created a Pinterest board with striped dresses from many eras. 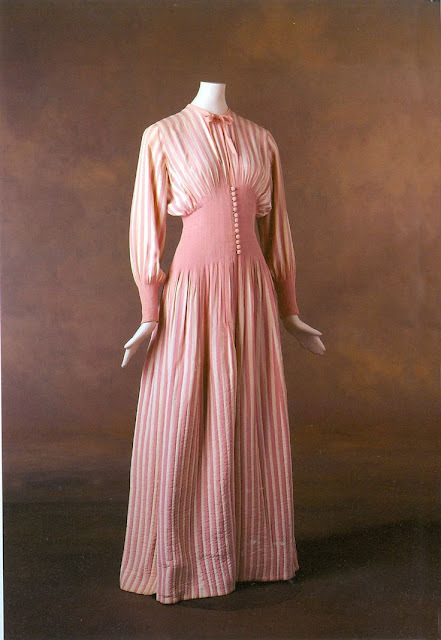 My primary inspirations were a few striped Thirties gowns by Elizabeth Hawes, but every time I hit a snag, I'd ask myself, What would Helen Rose do? Looking through my Pinterest boards earlier today, I found a few other silhouettes and styles that must have embedded themselves in my unconscious. Helen Rose design from "A Date With Judy" worn by Elizabeth Taylor. Have a great day everybody -- stripes rule! Thank you, Chic Fabrics/Fabric For Less for this $4.99/yd. cotton-poly beauty! Any human being would be thrilled to wear that dress, sweetie. It's just so beautiful, I am at a lack for words. Okay: hotcha! that sums it up. Great dress. I love the design work you put into it. Beautiful! And the craftsmanship is impeccable. Bravo! As always your workmanship is impeccable. I adore the midriff and pleated skirt. Your skills are so impressive, Peter. Hi Peter it's Erica from Ladies Tailoring I! I wanted to congratulate you on completing the class and your beautiful work. I love the final project. These look like very advanced skills you've acquired..fantastic stuff! Great dress and fascinating to see all the combinations you did. Impressive! Love the fine details on this! The yoke is really striking! Peter, I think you missed your calling-- This dress is fabulous in my book. I see an A+ coming as your grade! I am always amazed at how fast you can turn out such a beautiful project. I love this dress! I wish I was skinny enough to wear it! I am a quilter but you are really making me want to try my hand at sewing clothes. 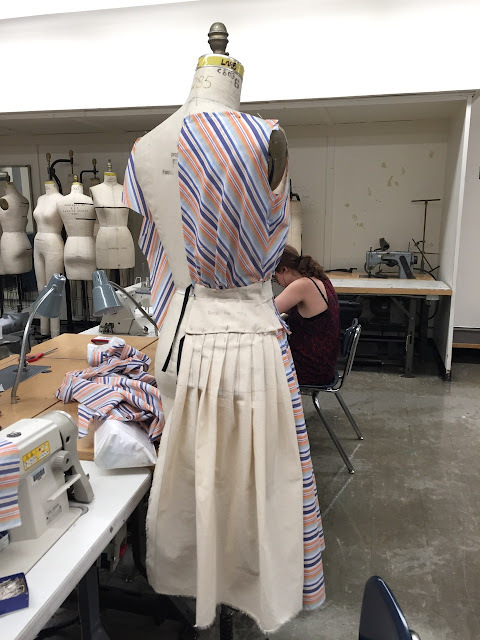 Stripes, bias, pipping! It all works together beautifully! You did an outstanding job in this class, and thank you for including us in your journey. Peter that is an outstanding design! 40's-schmorties, it's a beautiful dress and the fabric color gives it a contemporary look. If you're so inclined, I think it'd be worth developing into a pattern. I can definitely see people making and wearing this. I love the dress and the 40s vibe! Especially like the way it accentuates the waist. Ps., piping is fun on shirt yokes too. Pete, you're becoming a genuine fashion designer before our eyes! Thanks again for taking us with you on your journey -- with you, vicarious is visceral. I want to step through my computer and into the classroom, feel that beautiful fabric and admire all the details. Congratulations. I love the finished dress! What a great experience and end result. The dress is gorgeous. 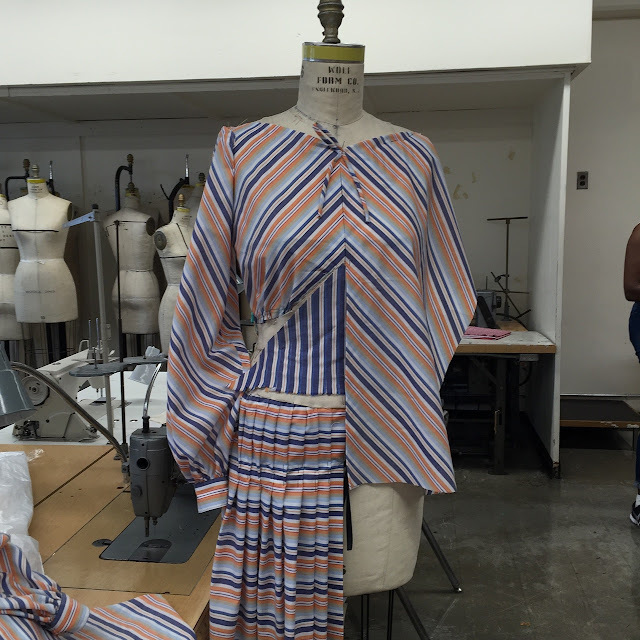 Thanks you for sharing your draping class experience. Your work is a real inspiration. You amaze me! I love all the designs you came up with. Thanks for taking us all along on this journey.. I will admit that when I first saw the finished project on Instagram, I wasn't a fan of the contrast midriff. However, after seeing some of your original ideas, I like the contrast the best. 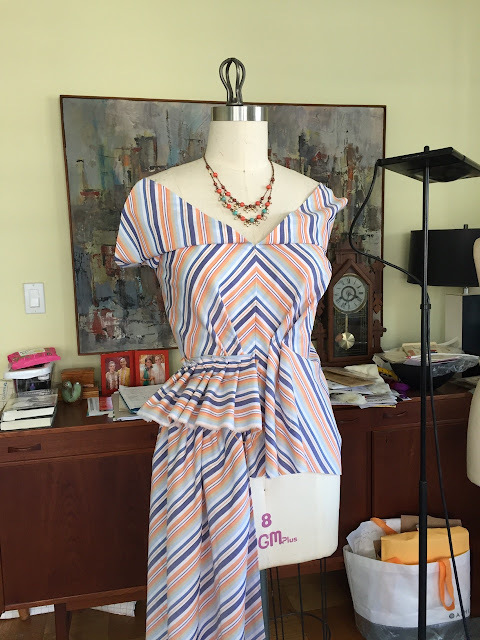 It's a great eye-breaker for the stripes and chevron on the bodice. Well done Peter! Wow you draped the $h!t out of the fabric!! Well, I can say the class was well worth it if it expanded your creativity and looking at the end result it did. You did a great job. Absolutely beautiful. I feel like I have just stepped back in time looking at this dress. Congratulations! Have to say you got so many techniques into this dress, and it turned out fabulous!! I love it! What a clever use of the stripe for the midriff yoke. Also, VERY clever use of the piping to stitch the pieces from the right side! Thank you for allowing us to follow you on this journey. Very inspiring. Wow!! As someone works to match stripes, I am so very impressed. Not only across the front but also in the mirror image of the bias of the sleeves. 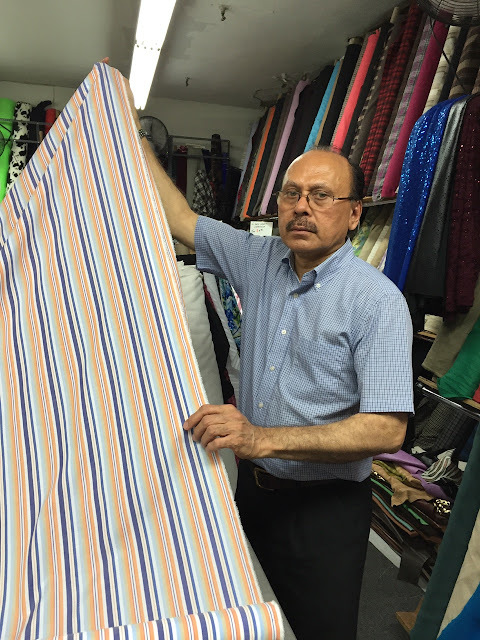 With that stripe, any thing that is off would stand out like a shout. Nothing does. Great work!